Although it is sometimes difficult to believe, there is actually a Grand Plan for the Moseley Railway Trust’s Apedale site. Phase One was to build the Apedale Valley Light Railway as far as Apedale Road – this was opened to the public in August 2010. Phase Two is the building of the National Industrial Narrow Gauge Railway Museum. Fundraising for the Museum has been somewhat challenging – thanks in no small measure to the activities of Fred the Shred and his pals. Anyway, we’ve scraped together the cash to at least begin the foundations. 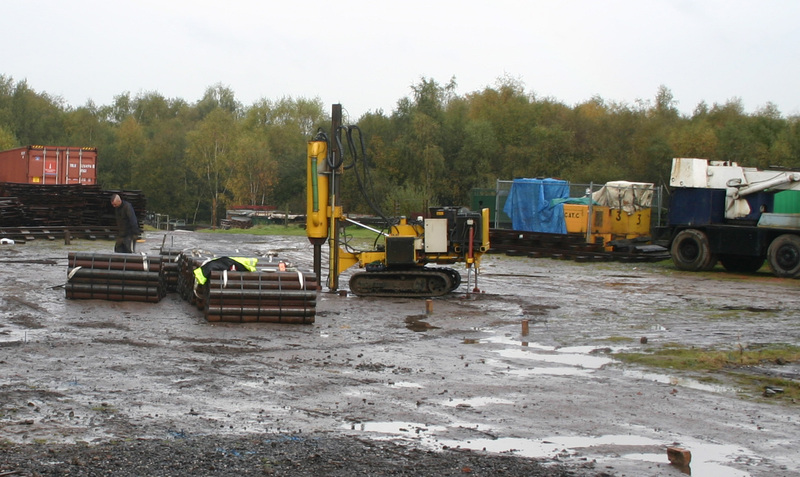 The contractors have arrived on site to begin driving the steel piles into the ground which are needed due to the site being riddled with mine shafts and the like. The yellow machine they’ve been using has attracted some interest. Partially this is because we’re all big kids at heart, but mainly because it was delivered by Thunderbird Two. Meanwhile, the running season on the AVLR has come to an end, giving us a much-needed break for track and vehicle maintenance. We will next be running for the public (and for a fat bloke in a red suit) in December – 10,11,17,18 to be precise. You can get full details of this here. As ever, get in touch here.